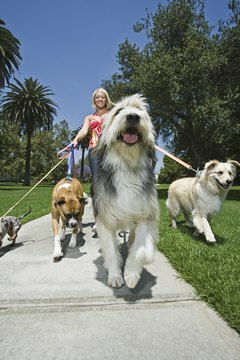 If you have a large or medium-sized dog, its constant tugging during walks can cause back trouble. Even if you have no history of back problems, the daily grind of walking your pooch can lead to serious issues. However, if you research the problem and learn about the various solutions, you should be able to treat your back pain. Lower back pain from dog walking typically occurs because of inexperience. Most new dog owners have not developed the necessary back muscles to deal with the pulling. When your back remains stiff, it absorbs the force, causing lower back problems over time. Younger dogs in particular are full of energy and are more likely to pull you along. However, any dog, if not properly trained, can cause similar problems. The best way to deal with this problem, is to train your dog properly. With the proper training, your dog will walk beside you, or can even follow along without a leash at all. This will address the central reason for your back pain. The easiest way to train your dog in this manner is to stop walking whenever it begins to pull. Your dog will gradually learn the proper behavior. Telling your dog to sit or stay whenever it pulls speeds up this process. Special leashes can help you train your dog and reduce stress on your lower back as well as your dog's neck. These leashes all work on different principles. Some are full-body harnesses that provide better leverage, while others have special mechanisms that add extra tension when your dog pulls. These leashes are available at pet stores and online. Tell the clerk your problem and ask if she has any suggestions. The best way to avoid lower back pain is to bend your knees while walking. This way, your knees and not your back will absorb the force of your dog's tugs. Try to wear sensible foot wear that cushion your steps and avoid picking up your dog when possible. The problem may also lessen on its own, since your back muscles should develop over time. Visiting a chiropractor is another way of treating your back pain. These specialists apply pressure to keep your back properly aligned and pain-free.